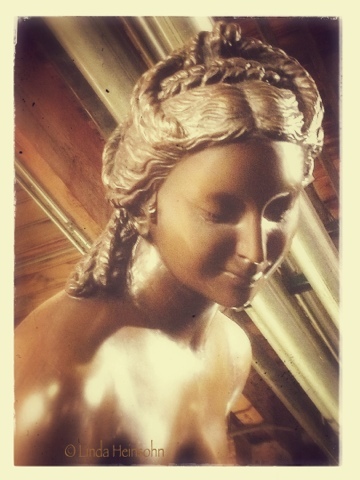 Yesterday I played with light and light reflection on this bronze statue at the wedding venue. I enjoyed the odd juxtaposition of the woman's face with the industrial pipes in the ceiling. This warehouse is a cacophony of architectural details, columns, statuary, neon or antique signs, funky furniture, sculpture, church pews, art projects, and lighting. That's probably only 10% of what you'll find stashed here. Tomorrow, I'll share the name of this place in Chicago. For now, take a look at my Warehouse Madonna.